Apropos to all this, a vintage Woodstock poster--the iconic red poster featuring a stylized dove perched on the fretboard of a guitar--is headed to auction on January 31 in Philadelphia. 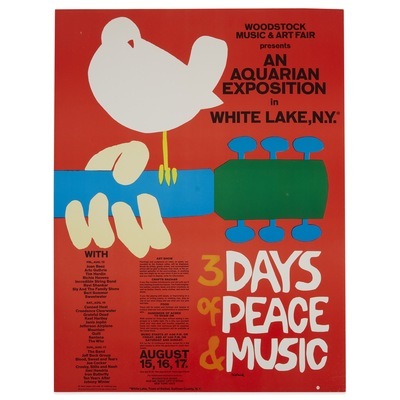 Designed by Arnold Skolnick, the groovy poster advertises “3 Days of Peace & Music,” in White Lake, NY, and features the names of performers like The Who, Jimi Hendrix, and Janis Joplin. The estimate is $800-1,200. As you can see above, Woodstock 50’s logo riffs on Skolnick’s dove, and indeed the organization tweeted last week, “The Bird of Peace is Back,” when it unveiled its plans. This year marks the 50th anniversary of the music festival known simply as Woodstock. As just about everyone knows by now, the festival was not held in Woodstock, New York--although anyone who visits the town today would not be disappointed by the amount of tie-dye and goodwill to be found there--and neither will this 50th anniversary edition, opting instead for the larger space at Watkins Glen International Speedway. From August 16-18, the festival's original producers are planning to bring both music and social activism to a new generation of concert-goers, the children, or more likely, the grandchildren, of original attendees. In a press release, Woodstock 1969's co-producer and co-founder Michael Lang commented, "The original festival in '69 was a reaction by the youth of the time to the causes we felt compelled to fight for - civil rights, women's rights, and the antiwar movement, and it gave way to our mission to share peace, love and music. Today, we're experiencing similar disconnects in our country, and one thing we've learned is that music has the power to bring people together. So, it's time to bring the Woodstock spirit back, get involved and make our voices heard." Apropos to all this, a vintage Woodstock poster--the iconic red poster featuring a stylized dove perched on the fretboard of a guitar--is headed to auction on January 31 in Philadelphia. Designed by Arnold Skolnick, the groovy poster advertises "3 Days of Peace & Music," in White Lake, NY, and features the names of performers like The Who, Jimi Hendrix, and Janis Joplin. The estimate is $800-1,200. As you can see above, Woodstock 50's logo riffs on Skolnick's dove, and indeed the organization tweeted last week, "The Bird of Peace is Back," when it unveiled its plans.